Item is a photograph of Burns' Drug Store, which also shows the Cape Breton Boat and Shoe Store. 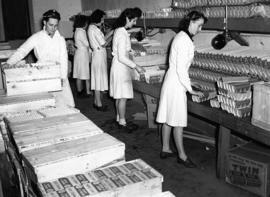 Item is a photograph of four women and a man packing eggs in a factory. 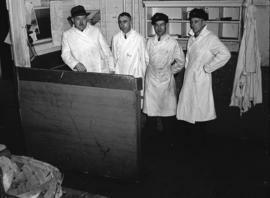 Item is a photograph of four men in a factory dressed in butchers clothes. 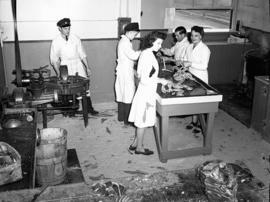 Item is a photograph of men and women making sausages in a factory. Item is a photograph of four women and a man packing eggs. Item is a photograph of two men butchering a pig in a factory. Item is a photograph of a group of men and women. Item is a photograph of the float that was created by the Chappell's Building Supply Company for the Sydney Centennial Celebration. Item is a photograph of a group of men standing next to a line of trucks from Chappells Limited.